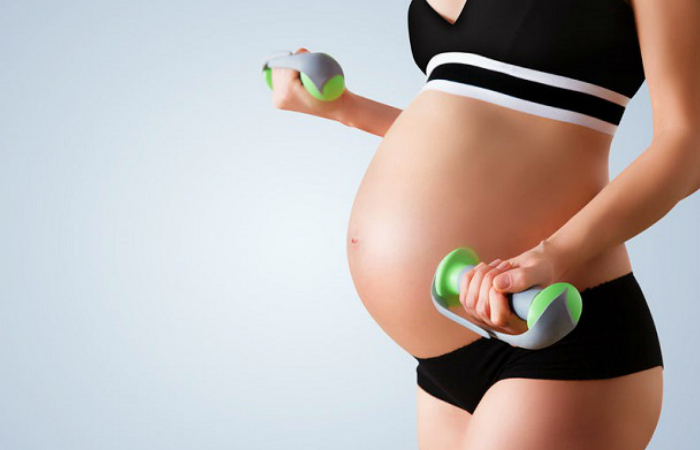 Don’t settle for just any maternity bra if you want to stay fit even while you’re pregnant. With a sports bra, there’s better support. Since you still need a bigger size for comfort, we highly recommend the best sports bra for pregnancy. Just like the standards we have for a regular sports bra, the appropriate type for pregnant women should also be breathable, moisture-resistant, and tighter than ordinary maternity bras. Without question, Gratlin Lightly Padded Sports Maternity Bra fits the bill. Made of 86 percent polyamide and 14 percent Spandex, this product will keep you cool during a workout. It can resist moisture so your sweat will quickly evaporate. Of course, we shouldn’t forget the fact that it is very soft for sensitive breasts. Versatility is also a strong suit of this sports bra. Feel free to wear it postpartum when you’ll face another challenge – nursing your baby. You may detach the bra effortlessly in public before you breastfeed your child underneath a nursing cover. And, since your breasts will get fuller because of milk, you need a stronger support and wider coverage. This sports bra ensures that there will be minimal bouncing to reduce pain when you exercise. Despite its tight fit, it won’t affect your milk supply because of its softness. Even though MIRITY Padded Freedom Sports Bra obviously has pads that you can’t see in most maternity bras, it still has a really soft band to reduce pressure under your breasts. The pads only prove how excellent this bra is when it comes to supporting your breasts. Don’t worry; you can still remove them if you want. With its 90 percent nylon and 10 percent Spandex fabric, this product has a four-way stretch to guarantee the right fit for your body. Additionally, since the elastic material is smooth, lightweight, and soft, it is moisture-resistant and breathable. Aren’t you curious why this product is called a “freedom” bra? Well, it actually has a racerback design to give you total control of your movements. Meaning, you’ll have more effective workout sessions. Sick of the usual plain color of maternity sports bras? 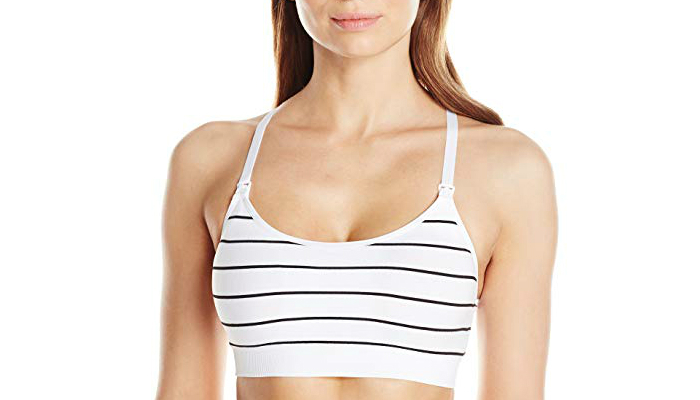 Rosie Pope Seamless Nursing Sports Bra is designed with black and white stripes, which is clearly attractive. Another nylon-Spandex bra, this product is lightweight, breathable, and moisture-resistant for a great workout. 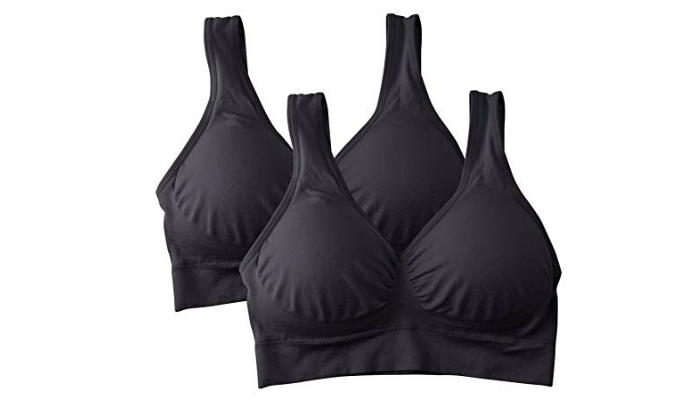 It can even serve as an excellent sleep bra because of its softness. Sleeping with a bra is actually a thing, especially for nursing moms who struggle with uncontrollable leaks. Moving on, typical sports bras can’t be adjusted easily. Good thing that this one has adjustable straps, which is useful for pregnancy due to breast development. The straps even form a racerback for enhanced support. Finally, here’s a cotton bra that takes softness up a notch. Aivtalk Wirefree Maternity Sports Bra is made of pure cotton to ensure breathability. It is ideal for hot days. Despite its smaller look, this product can actually expand throughout your pregnancy because of its ribbed gore. It even comes with an additional fastener. Both of these features guarantee that this bra can stretch no matter how significant the changes are. Since Motherhood Maternity Sports Bra has a soft V-neck, a ruche at the center, and princess seams, it provides medium support but full coverage – enough for pregnant women. The gentle support also makes this sports bra a favorite for lounging and casual days outdoors. You can wear it with almost any shirt or blouse. When it comes to the material, the main fabric is a nylon-Spandex blend while the lining is cotton-Spandex. This combination obviously aims for the right balance of support and comfort. Because of its very affordable price and fun variety of colors, HuaErZui Plus Size Sports Bra is probably the best option out there if you want to collect a lot of high-quality maternity bras. They’re so soft and lightweight that it will feel like you’re not wearing a bra at all. Meanwhile, not all women like to wear racerback bras. Fortunately, this product doesn’t have one. This should be your number one priority. If your sports bra is too loose, there would be less support which may result in a painful workout. On the other hand, if it’s too tight, you’d be so uncomfortable that it could even harm your pregnancy. What you should be looking for is a sports bra that can slightly press your breasts together to avoid painful bouncing during movement. It should be a little tighter than a typical maternity bra. However, keep the band wide and soft to ensure comfort. Speaking of comfort, the material should be soft and lightweight to enhance airflow. This will keep you cool during a workout. Ideal fabrics include nylon, cotton, and Spandex. As a plus, nylon is a strong elastic material. It can withstand heavy use. That’s why a lot of sports bras include nylon in their fabric blend. Aside from its irresistible softness, cotton is also in-demand because it can be hypoallergenic. The only downside is that it tends to absorb moisture, which may slow down the evaporation of sweat. Lastly, sports bras are meant to contain Spandex because this material is very elastic. Spandex is a huge factor why many sports bras can help you perform better during exercise. After considering its support features and material, we ultimately decided to make Gratlin Lightly Padded Sports Maternity Bra as the best sports bra for pregnancy. Its versatility is also praise-worthy. Aside from being a sports bra and a maternity bra in just one product, it can also be a nursing bra that’s helpful when you need to breastfeed in public.